Because I slept through Sunday, I was unable to fully experience the fact our Vice President shot someone in the face this weekend. 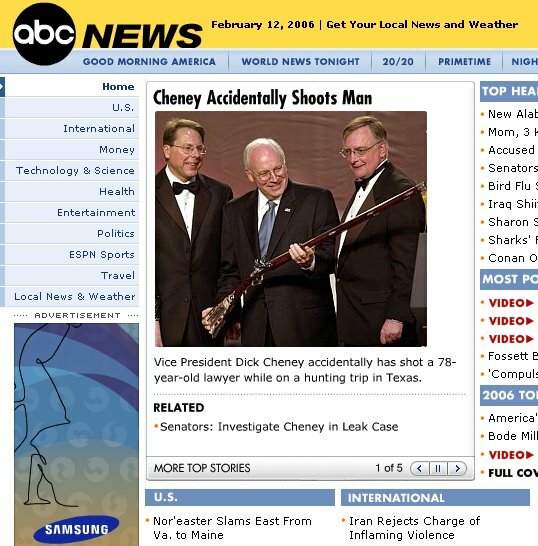 Aside from my roommate running into my room and telling my nearly unconsciousness self that "Cheney shot someone by accident on a hunting trip", I knew nothing about it. In fact, a call from my dad around 10am Monday morning asking amazedly why I had not commented on it was the first actual thought I had on the subject. But, to be fair, it's 9:15am on Tuesday now, and even the NRA has yet to comment on the shooting. Leave it to my heroes, Jon Stewart & Co to rip the story to shreds, and if you expected anything less, for shame. The whole story is something of a Cheney-haters dream come true, with the best thing being that Cheney didn't kill the guy. While message-wise, we on the left might have had a few choice hits for the gun safety lobby, we wouldn't be able to get the sheer joy out of the fact our Vice President shot a 78-year-old man in the face we now can have seeing as the guy survived. Honestly though, I myself can't point too much vitriol at our Vice President (who recently transported buckshot into a 78-year-old's face at amazing speed), because truthfully, I've been where he is. I've gone on hunting trips where the birds are planted in the fields. I'm sure I've lost track of someone in my party for a portion of time. However, there's an unspoken rule... actually, come to think about, it's not that unspoken, it's discussed beforehand, just what exactly your cone of shooting is. 2) Add about 45 degrees on both sides, before your vision gets too blurry to make out objects. That's your cone. Some may call it line-of-sight. You're gonna be scaring up birds in front of you, and there's a chance one might fly off to the side, and somehow get behind you. This is when you usually have the guy on the end go slightly out of his comfortable Cone and take it out. Why the guy on the end? Well basically because there's not supposed to be anyone next to him that he could be pointing his gun at. Swinging completely around in a 180? Now, truth-be-told I haven't hunted birds that often, but personally, I can't imagine ever doing it. Still accidents happen. And when they do, you be a man and take responsibility. Personally, I had a near accident when I was a kid in that I nearly shot my dad's foot off while standing around doing nothing. If your like me, after that, you don't go hunting for a few years, to clear your head. If you're like our Vice President, who technically did nearly commit manslaughter on Saturday morning - and without a valid license - you blame the guy for sneaking up on you, then you blame the dog for not retrieving fast enough... I wonder if the bird's getting blamed next. Speaking of... I can't seem to find any mention whether he even got the bird. I'd ask whether or not our VP can even hit the broad-side of a barn, but since he was able to tag the face of a 78-year-old man with a shotgun, he has to have some accumen. I wonder what would happen IF the guy that intercepted that load of birdshot dies from his injuries? The guy did have a "minor" heart attack yesterday caused by a pellet being lodged up against his heart! Would Dickie step down? Would he be charged with manslaughter(yep!) Would "sorry" be enough? I mean come on...the guy didn't go hunting thinking he was in a dual with the VP! Happy Valentine's Day to you too Holzie.